The cold waters surrounding the continent of Antarctica are extremely rich in oxygen, and, therefore, have abundant plant and animal plankton to feed creatures from the tiniest fish to the largest whales. These Antarctic waters were the harvesting ground for the great age of whaling in the 19th and early 20th centuries which helped build commercial empires in America and Europe. I use the word 'great', but at the same time it was tragic. The largest creatures to inhabit earth, and also among the most intelligent, were cruelly slaughtered and brought to the brink of extinction. In the cold, dry mausoleum of Antarctica, decomposition is slow. The former whaling stations stand abandoned with the great wrecks of these whales scattered on the beaches. 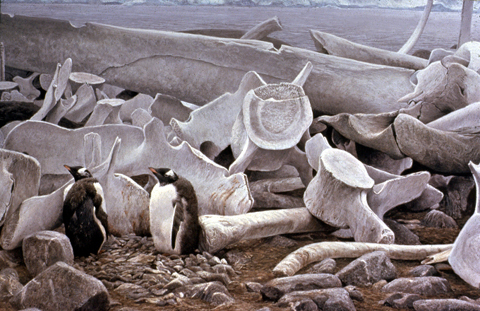 The two gentoo penguins huddle among great wrecks of whale bones, colossal monuments that once were masters of the seas. The penguins give a sense of continuing life. They will soon take to the sea for the coming winter, but the great bones will stay as a testimony through the years.